Lately, I’ve been extra-obsessed with packing as many nutrients as possible into our family meals thanks to the book “How Not To Die” by Michael Greger and Gene Stone. I’ve always been health-conscious, but after reading this book, I’ve been inspired to take things to another level. As I prepare meals, I play the “how many superfoods can I incorporate” game. It’s actually fun! One superfood I add to almost every dish is hemp hearts (I use the brand Manitoba Harvest), a super plant that’s high in protein (including all ten essential amino acids), healthy fats (omega-3 and omega-6) and iron. They contain twice the amount of protein found in chia and flax seeds and are lower in carbs. It’s nice to have a sustainable protein option that is so amazingly versatile!!! In a bowl, combine oats, plant milk, cinnamon and vanilla. in a small pot, add chopped apples and about 1/8 c. water and cook on medium heat. Cover with a lid. When water evaporates add another splash so apples don’t stick to pot. Add cinnamon and stir. Cook until soft (about 12-15 min). Pour molasses on the inner sides of a glass jar or container (preferably with a lid), then add half the apples to the base of the jar. Cover apples with oat mixture and top with remaining apples. Sprinkle with hemp hearts and drizzle with maple syrup if you like it sweet. Preheat oven to 400F and cut squash lengthwise and stab a few times with a small, sharp knives. Spritz with oil and rub with spices. 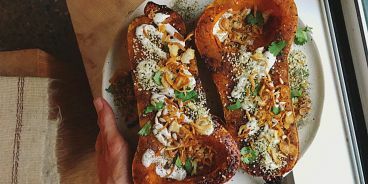 Place squash cut-side down on a parchment or silpat-lined bake tray and bake until soft, about 40 minutes. To make sauce: add all ingredients to a high-powered blender and puree until silky smooth. 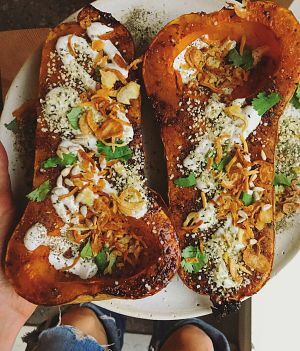 Remove squash from oven, drizzle on the sauce (I use a squeeze bottle, available at any food equipment store), sprinkle with hemp hearts, fried onions, cilantro and salt + pepper. For the spiced jackfruit: heat oil in a pan on medium heat and add jackfruit. Using a wooden spoon, mash the jackfruit to break it apart. Add spices and cook for about 5 minutes. Build the sliders: toast buns in toaster then add spinach to the base. 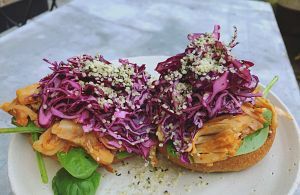 Top with slaw, jackfruit, then a generous sprinkling of hemp hearts. Hope you enjoy these recipes!!! 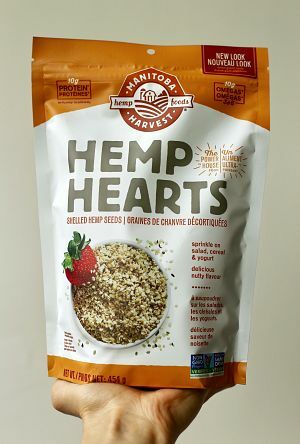 If you’d like to incorporate more hemp seeds into your diet, Manitoba Harvest also makes Hemp Heart Toppers, Hemp Heart Bites, Toasted Hemp Seeds, Hemp Proteins, Hemp Protein Smoothies and Hemp Oil. 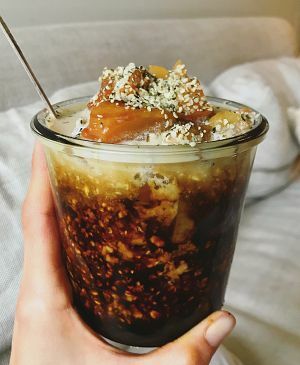 For more hemp seed recipes that you can make at home, head to manitobaharvest.com. Manitoba Harvest and I are giving away a nutritious prize pack to one lucky winner!!! Over on Instagram here, share your favourite way to eat hemp hearts in the comments and tag a friend (maybe they’ll want to enter, too!). Winner will be chosen on Friday, December 1st. Check back here or on Instagram to see if you won! The prize will be shipped to the winner. UPDATE: Congrats to @KatieB642 who is our winner!! Thanks to all who entered!! Thanks to Manitoba Harvest for sponsoring this post! All opinions are my own.